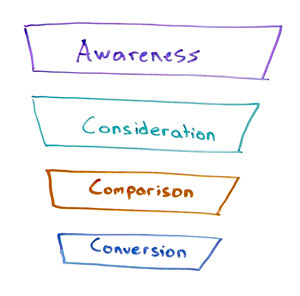 Moving your customers down the funnel from awareness to conversion can make for a winding and treacherous road. Until you fully research and understand the buying process inside and out, it’s far too easy to make a misstep. In today’s Whiteboard Friday, Rand steps back to take a higher-level look at the path to customer purchase, recommending workflows and tools to help you forge your own way. Howdy, Moz fans, and welcome to another edition of Whiteboard Friday. 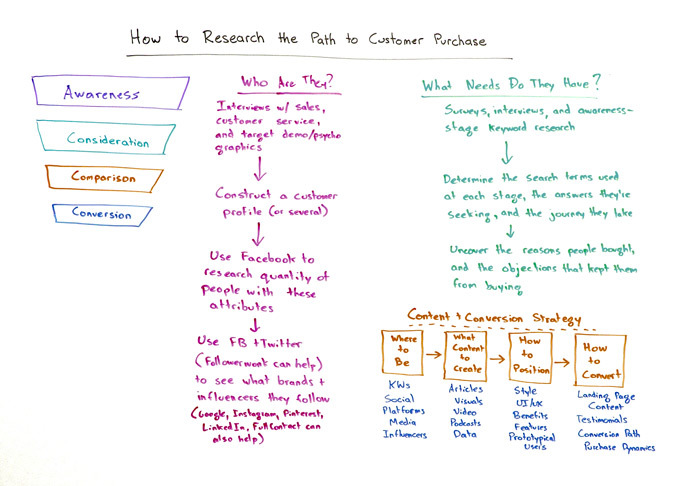 This week we’re going to chat about the path to customer purchase and how to research that path. The reason this is so critical is because we have to understand a few things like our content and conversion strategy around where do we need to be, what content we need to create, how to position ourselves, our product, our brand, and how to convert people. We can’t know this stuff until we truly understand the buying process. We’ve done a lot of Whiteboard Fridays that involve very, very tactically specific items in one of the steps in these, like: how to understand the awareness funnel and how to build your social media audience; or how to get into the consideration process and understand how you compare against your competition; or how to convert people at the very end of the buying cycle on a landing page. But I want to take a step back because, as I’ve talked to a lot of you out there and heard comments from you, I think that this bigger picture of, “How do I understand this research process,” is something we need to address. So let’s start with: How do we understand who our buyers actually are, and what’s the research process we can use for that? My general sense is that we need to start with interviews with a few people, with salespeople if you’re working with a team that has sales, with customer service, especially if you’re working with a team that has customer service folks who talk to lots of their audience, and potentially with your target demographic and psychographic audience. Demographic audience would be like: Where are they, what gender are they, and what age group are they? Psychographics would be things around their interest levels in certain things and what they consume and how they behave, all of that type of stuff. For example, let’s say we’re going to go target Scotch whisky drinkers. Now, I am personally among that set of Scotch whisky drinkers. I’m big fan of a number of scotches, as are many Mozzers. In fact, I have a bottle of Ardbeg — I think it’s the Uigeadail — in my office here at Moz. So I might go, “Well, let’s see. Let’s talk to the people who sell whisky at stores. Let’s talk to the people who sell it online. Let’s talk to the customer service folks. Let’s do interviews with people who are likely Scotch buyers, which are both male and female, perhaps slightly more demographically skewed male, tend to be in a slightly wealthier, maybe middle income and up income bracket, tend to be people who live in cities more than people who live in urban and rural areas, tend to also have interests around things like fashion and maybe automobiles and maybe beer and other forms of alcohol.” So we can figure out all that stuff and then we can do those interviews. What we’re trying to get to is a customer profile or several customer profiles. A lot of folks call this a “customer persona,” and they’ll name the persona. I think that’s a fine approach, but you can have a more abstract customer profile as well. Then once you have that, you can use a tool like Facebook, through their advertising audience system, to research the quantity of people who have the particular attributes or affiliations that you’re seeking out. From there, you can expand again by using Facebook and Twitter. You could use Followerwonk, for example in Twitter specifically, to figure out: What are these people following? Who are their influencers? What are the brands they pay attention to? What are the media outlets? What are the individuals? What are the blogs or content creators that they follow? You can also do this with a few other tools. For example, if you’re searching out just content in general, you might use Google Search. You could do this on Instagram or Pinterest or LinkedIn for additional networks. There’s a very cool tool called FullContact, which has an API that essentially let’s you plug in let’s say you have a set of email addresses from your interview process. You can plug that into FullContact and you can see the profiles that all of those email addresses have across all these social networks. Now I can start to do this type of work, and I can go plug things into Followerwonk. I can go plug them into Facebook, and I can actually see specifically who those groups follow. Now I can start to build a true idea of who these people are and who they follow. Now that I’ve researched that, I need to know what needs those folks actually have. I understand my audience at least a little bit, but now I need to understand what they want. Again, I go back to that interview process. It’s very, very powerful. It is time-intensive. It will not be a time-saving activity. Interviews take a long time and a lot of effort and require a tremendous amount of resources, but you also get deep, deep empathy and understanding from an interview process. Surveys are another good way to go, but you get much less deep information from them. You can however get good broad information, and I’ve really enjoyed those. If you don’t already have an audience, you can start with something like SurveyMonkey Audience or Google Surveys, which let you target a broad group, and both of those are reasonable if you’re targeting the right sorts of broad enough demographics or psychographics. The other thing I want to do here is some awareness stage keyword research. I want to understand that this awareness phase. As people are just understanding they have a problem, what do they search for? Keyword research on this can start from the highest level. So if I’m targeting Scotch, I might search for just Scotch by itself. If I plug that into a tool like Keyword Explorer or Keyword Planner or KeywordTool.io, I can see suggestions like, “What’s the best Scotch under $50?” When I see that, I start to gain an understanding of, “Oh, wait a minute. People are looking for quality. They also care about price.” Then I might see other things like, “Gosh, a lot of people search for ‘Islay versus Speyside.’ Oh, that’s interesting. They want to know which regions are different.” Or they search for “Japanese whisky versus Scotch whisky.” Aha, another interesting point at the awareness stage. From there, I can determine the search terms that are getting used at awareness stage. I can go to consideration. I can go to comparison. I can go to conversion points. That really helps me understand the journey that searchers are taking down this path. It’s not just search, though. Any time I have a search term or phase, I want to go plug that into places like Facebook. I want to plug it into something like Twitter search. I want to understand the influencers on the networks that I know my audience is in. That could be Instagram. It could be Pinterest. It could be LinkedIn. It could be any variety of networks. It could be Google News, maybe, if I’m seeing that they pay attention to a lot of media. Then once I have these search terms and awareness through the funnel, now I’ve got to understand: How do they get to that conversation point? Once I get there, what I’m really seeking out is: What are the reasons people bought? What are the things they considered? What are the objections that kept some of them from buying? 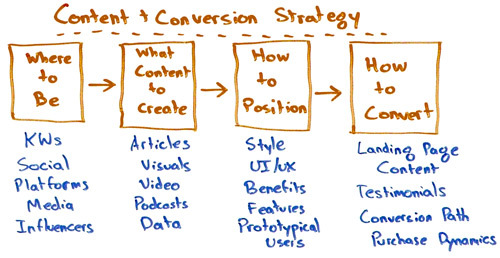 Creating a content & conversion strategy. “Where do I need to be” means things like: What keywords do I need to target? What social platforms do I need to be on? Where do I need to be in media? Who do I need to influence who’s influencing my audience? It tells me what content I need to create. I know what articles or videos or visuals or podcasts or data my audience is interested in and what helps compel them further and further down that funnel. It tells me a little bit about how to position myself in terms of things like style and UI/UX. Lastly, it tells me about how we can convert our target audience. Then it also tells us lastly, finally, through those objections and the reasons people bought, the landing page content, the testimonials to feature and what should be in those. It tells me about the conversion path and how I should expect people to flow through that: whether they have to come back many times or they make the purchase right away. Who they’re going to compare me against in terms of competitors. And finally the purchase dynamics: How do I want to sell? Do I need a refund policy? Do I need to have things like free shipping? Should this be on a subscription basis? Should I have a high upfront payment or a low upfront payment with ballooning costs over time, and all that type of stuff? This research process is not super simple. I certainly haven’t dived deep on every one of these aspects. But you can use this as a fundamental architecture to shape how you answer these questions in all of the web marketing channels you might pursue. Before you go pursue any one given channel, you might want to try and identify some of the holes you have in this. If you have questions about how to do this, go through and do this research first. You’ll have far better results at the end.